The move is on in Michigan and across the country to raise the minimum wage, and to help promote the effort President Barack Obama came to Ann Arbor for a speech at the University of Michigan. 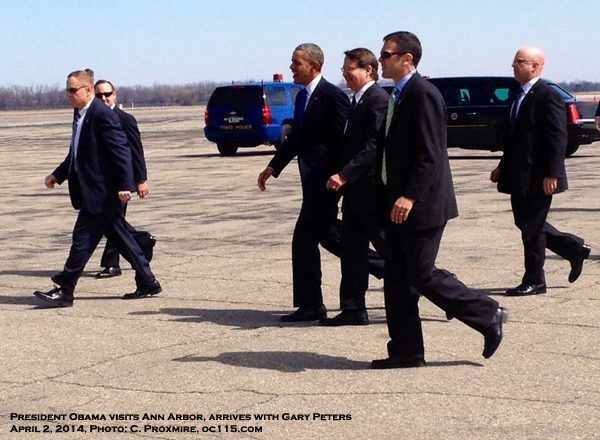 Stepping off Air Force One alongside him was Senatorial candidate Congressman Gary Peters. Peters and others in Michigan are leading the way with a ballot drive that would bring the minimum wage in Michigan from $7.40 an hour to $10.10 an hour. Raise Michigan is aiming to get 330,000 signatures by May 28 to get the question on the ballot for the November election. The coalition includes a diverse set of non-profit organizations including: the Center for Progressive Leadership, Michigan United, MOSES, the Restaurant Opportunity Center (ROC) Michigan, Mothering Justice and Building Movement Project/ People’s Platform. Currently the national minimum wage is $7.25, but President Obama wants that changed. He spoke about how in Michigan auto manufacturing innovator Henry Ford doubled the wages of his workers. “We need to make sure everyone can get a good, solid base so they can have a job and career,” he said. 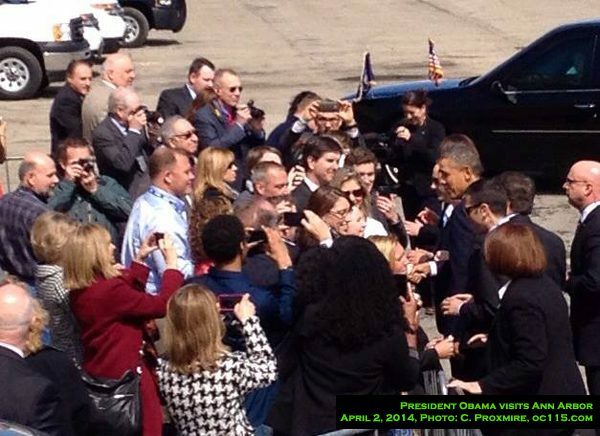 The President also talked about the need to reduce the wage disparity between genders. “I do not want my daughters paid less for doing the same job as somebody elses son,” he said. He also stopped for lunch at Zingerman’s Deli, a local business known for paying and treating their employees well. A recent poll showed that 65% of responders support a minimum wage increase in Michigan. Opponents claim it will slow job growth and be an imposition to business owners. Students camped out overnight to see Obama, who was also joined by Mark Schauer who is running against Michigan Governor Rick Snyder for his position. Schauer is expected to announce Thursday that his choice for Lt. Governor is Oakland County Clerk Lisa Brown, though the campaign has not confirmed this yet. More information on the Raise Michigan campaign can be found at http://www.raisemichigan.com. For a previous story on Raise Michigan, see http://oaklandcounty115.com/2014/01/27/group-seeks-ballot-measure-to-increase-minimum-wage/. 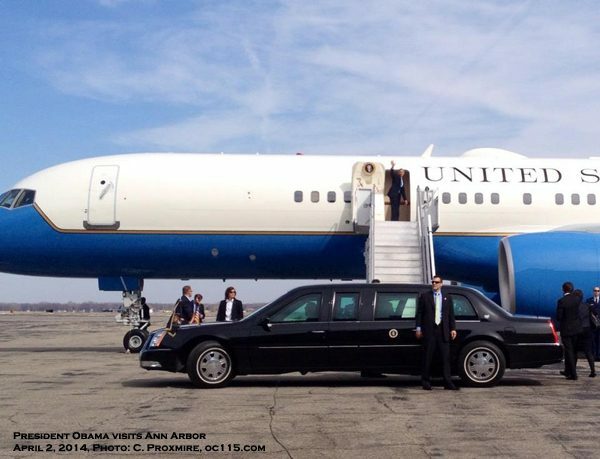 NOTE: Photos and videos of the President’s visit will be posted in the coming days! If you support the work of oc115, please show your support at http://oaklandcounty115.com/reader-support/.